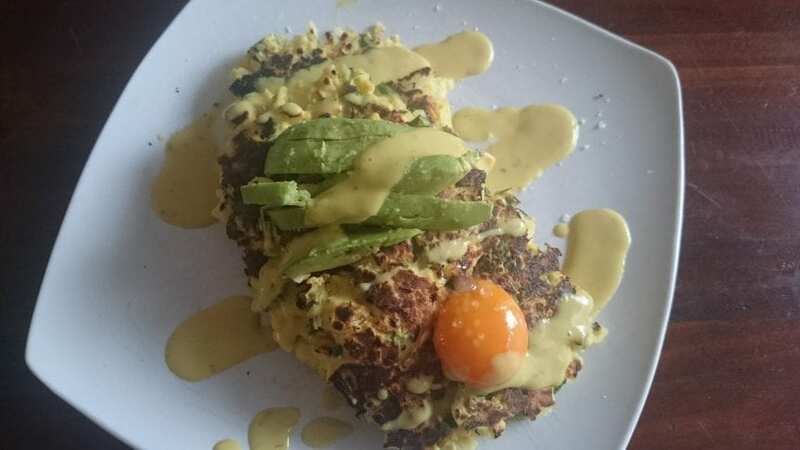 Cauliflower and asparagus fritters with Dijon mustard and avocado. You’re going to love these savoury morsels for breakfast, lunch and dinner! Dice the cauliflower and asparagus finely before microwaving on high for two and a half minutes to cook. Separate the eggs so you have three whites and mix together with the cauliflower, asparagus and lupin flour. Season well with salt and pepper. On a hot, lightly greased non-stick frying pan portion out the fritters and make into rough circle shapes. They will take roughly 90 seconds to cook on each side. Cook in batches until all the fritters are complete and when cooking the final batch, make a small hole in the centre of the last fritter and gently place the egg yolk inside. Place this fritter on top of a stack before mixing the Dijon mustard with a little water, laying the avocado on top of the stack and then pouring the Dijon mixture on top.